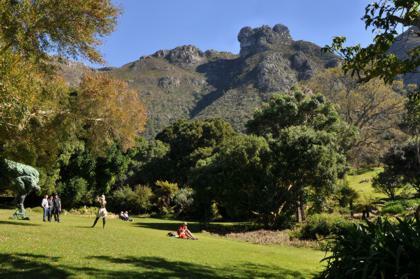 The Dell is the oldest, and arguably the most attractive part of Kirstenbosch. In this section of the Garden you will find cool shade, tall trees and cobbled paths of the Dell, crystal clear spring water in Colonel Bird’s Bath, ‘living fossils’ in the Cycad Garden. It is also the final resting place of the first director of the Garden, Prof. Harold Pearson beneath a magnificent Atlas Cedar. The Dell also contains a massive fig tree and the Pelargonium Koppie.